The Hawaii Soccer Federation (formerly known as the Maui Youth Soccer Organization) held its first league on Maui in 1975, when Peter D. Baldwin used his family's business (Haleakala Dairy) to sponsor the purchase of approximately 600 uniforms for Maui youth. 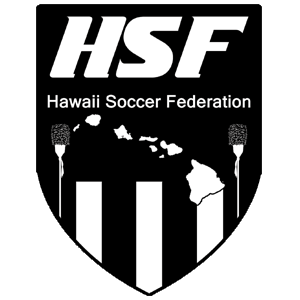 In 2010, HSF gained new leadership; became a non-profit 501(c)(3) organization; and expanded its vision and mission to serve Hawai'i soccer overall. In 2017, HSF became the legal owner and operator of Hawaii Futsal; and through indoor and outdoor programming, HSF now serves over 4,000 club soccer players, coaches, and administrators on Maui, O'ahu, Kaua'i, and Hawai'i island. Our mission is to foster the growth and development of club soccer players throughout Hawai'i, by creating an environment that improves the daily player experience, and raises the quality of Hawai'i soccer overall. We aim to heighten the standards that call for better club structure, organization, and operation, which generally leads to developing better players. Individual Players and their Families: We believe in the development of children as people first, and players second. We believe that individual player development should be a club's primary focus, and team success a secondary but important goal. Simple Administration: We believe a league should be governed by simple administrative procedures, which provides players, teams, and clubs flexibility in the player development process. Club Flexibility: We believe having a flexible roster is not only healthy for players, teams, clubs, and families, but it also reflects a realistic understanding of the changes occurring in these groups over a 12-month period. Year-Round Play: We believe that weekly competition combined with weekly practices and appropriate breaks provides players, teams, and clubs with the best opportunity for player development. High Level Activity: We believe in and support the studies that correlate the pursuit of high level athletics, with young people excelling in school, staying fit, avoiding drugs and alcohol, and building self esteem. Choices & Common Sense: We believe that children—with the support of their coaches and parents—can benefit immensely from the life lessons offered through participation in a high level soccer-learning environment. We believe that winning is fun, however, winning with integrity is key. The same holds true when losing, when under pressure, when wronged, or when unlucky. Coaches and parents have the responsibility of cheering players on, while being under control, and maintaining the proper perspective—no matter what is happening on the field. We believe the following qualities embody sportsmanship, and we encourage all of HSF’s Membership to embrace its attributes. Players First: Player development is first and foremost, rather than developing winning teams. Enjoyment: Especially in youth soccer, results should never be the first consideration. The overall enjoyment and development of players must be the primary focus—thereby creating lovers of the game. Growth: Weekly games are opportunities to learn and grow—as coaches, players, and supporters of our children and the beautiful game. A player’s effort and quality of play is more important than results. Respect: Players, parents, coaches, and referees are partners in youth development. While mistakes and inappropriate behavior are a part of human nature, we can always improve our thoughts, actions, and habits, remain under control, and maintain the proper perspective.